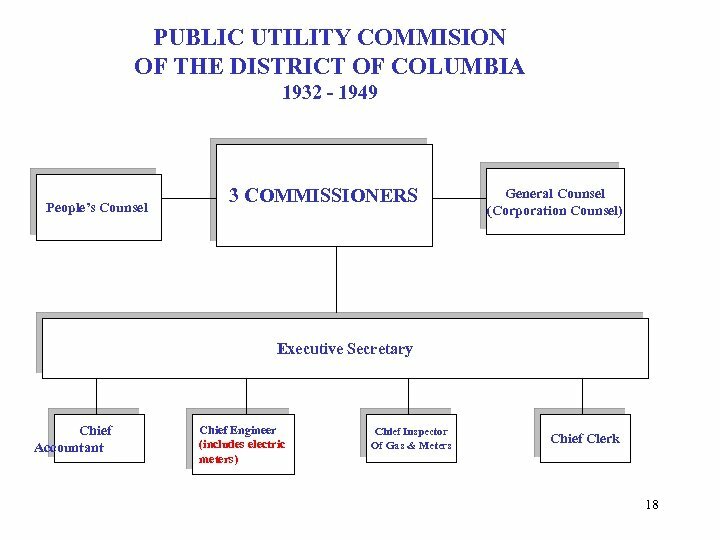 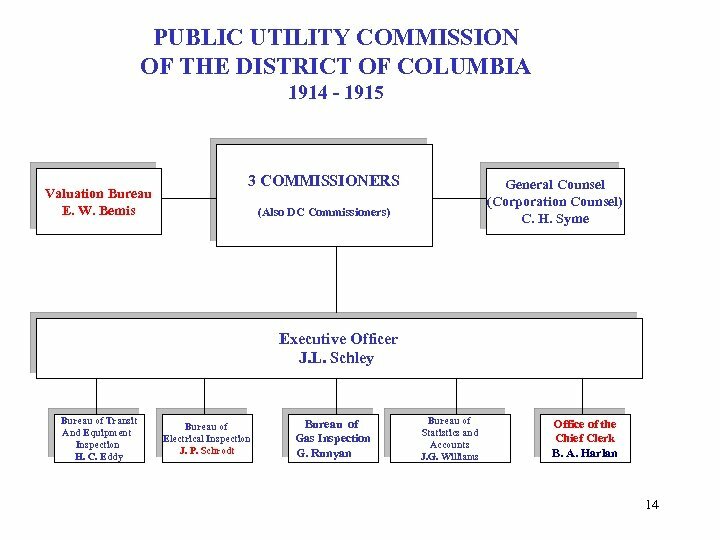 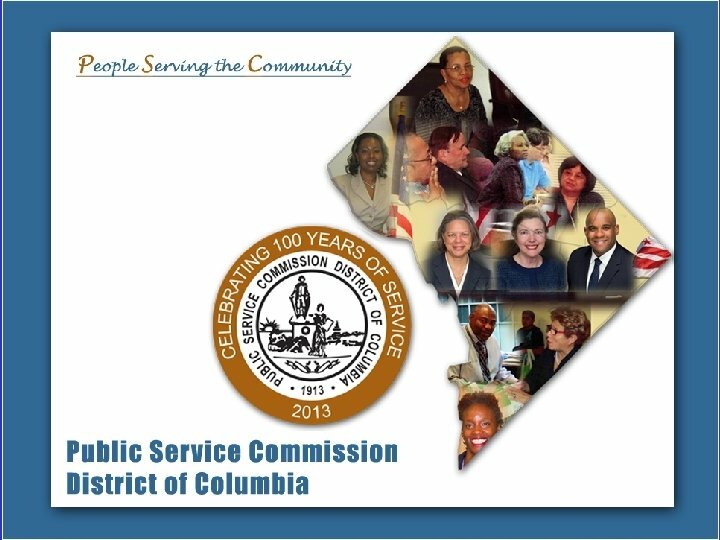 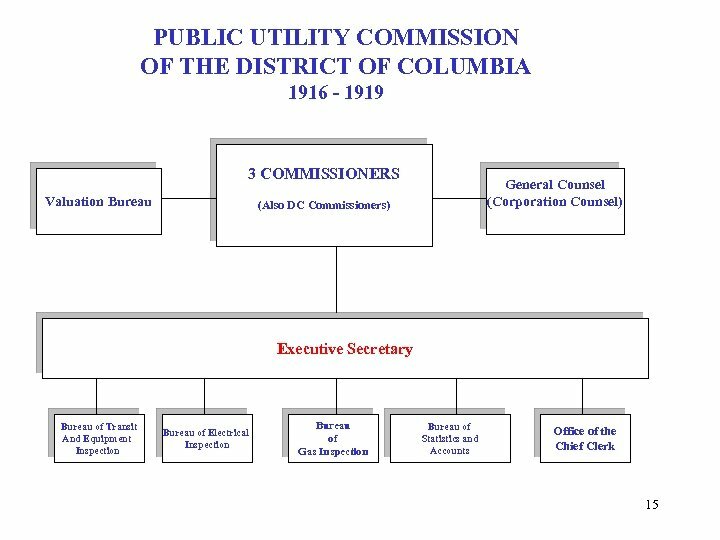 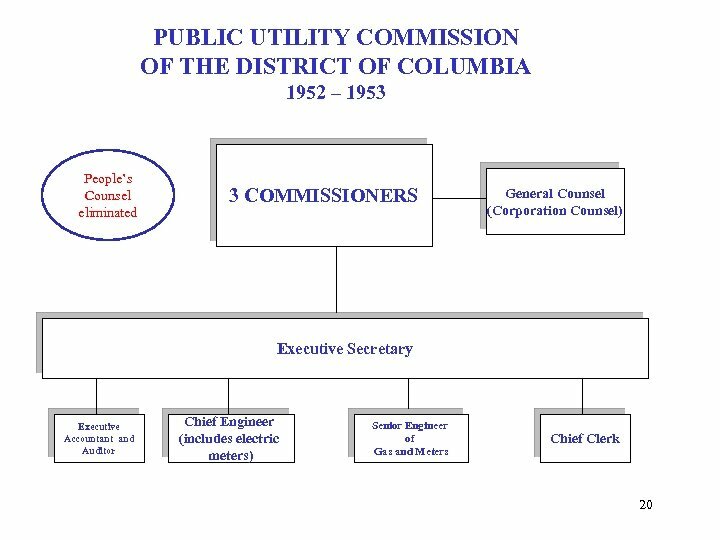 THE PUBLIC SERVICE COMMISSION The Public Utility Commission of the District of Columbia (Commission) was established by Congress in 1913 as an independent District Government agency to regulate the electric, natural gas, telephone, and transportation companies (street cars, taxicabs, etc. ) 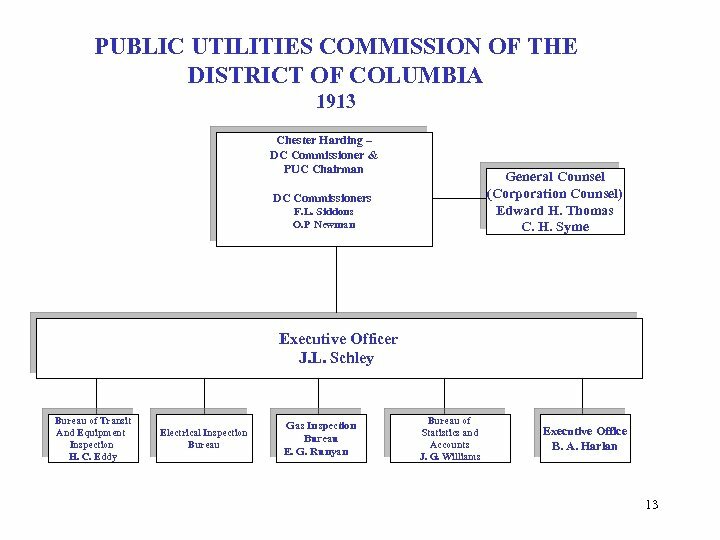 in the District. 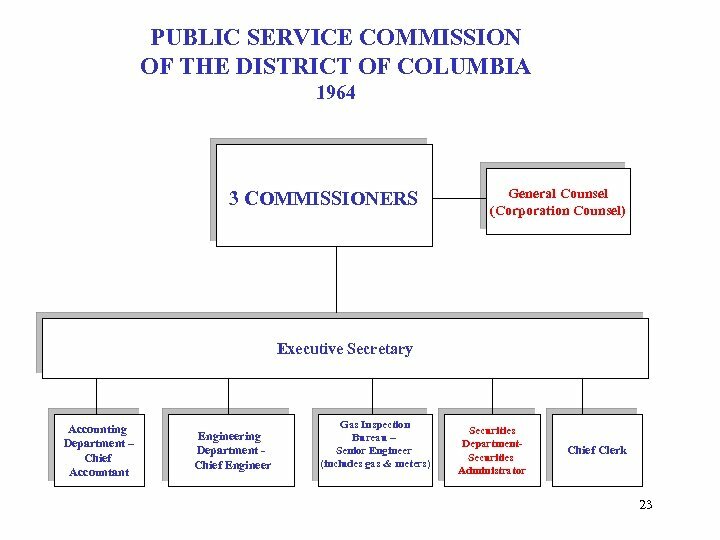 In 1964, the Commission’s name was changed to the Public Service Commission after it became responsible for also regulating the securities industry. 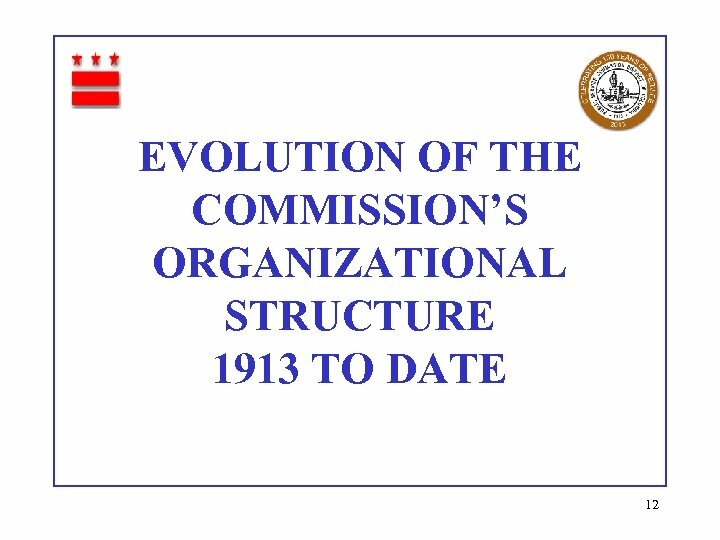 The Commission stopped regulating most transportation companies in 1987 when taxicab regulation was moved to a newly created Taxicab Commission. 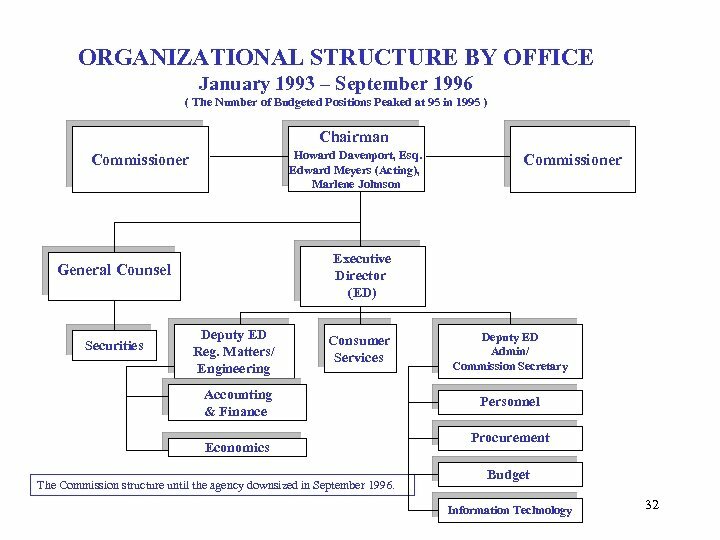 Jurisdiction over the securities industry was moved from the Commission to a newly created District Government agency called the 3 Department of Insurance, Banking, and Securities in 1997. 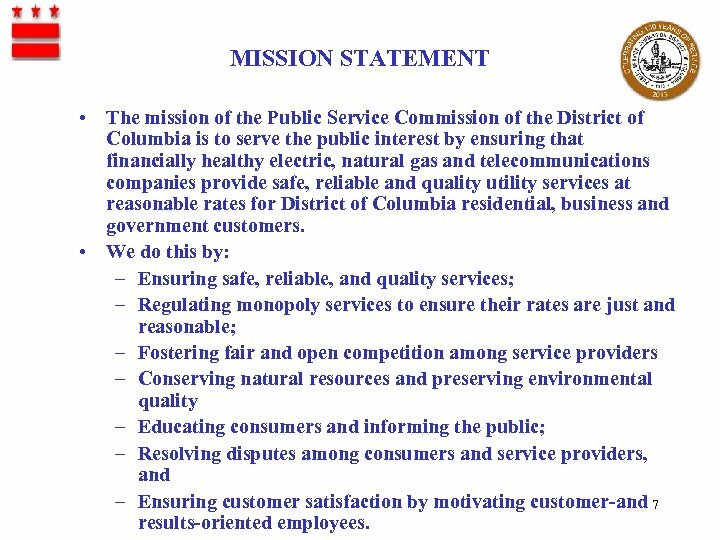 MISSION STATEMENT • The mission of the Public Service Commission of the District of Columbia is to serve the public interest by ensuring that financially healthy electric, natural gas and telecommunications companies provide safe, reliable and quality utility services at reasonable rates for District of Columbia residential, business and government customers. 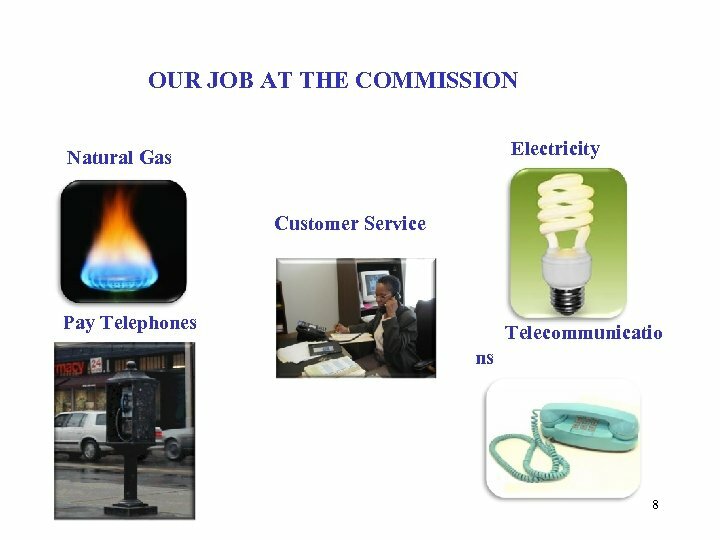 • We do this by: – Ensuring safe, reliable, and quality services; – Regulating monopoly services to ensure their rates are just and reasonable; – Fostering fair and open competition among service providers – Conserving natural resources and preserving environmental quality – Educating consumers and informing the public; – Resolving disputes among consumers and service providers, and – Ensuring customer satisfaction by motivating customer-and 7 results-oriented employees. 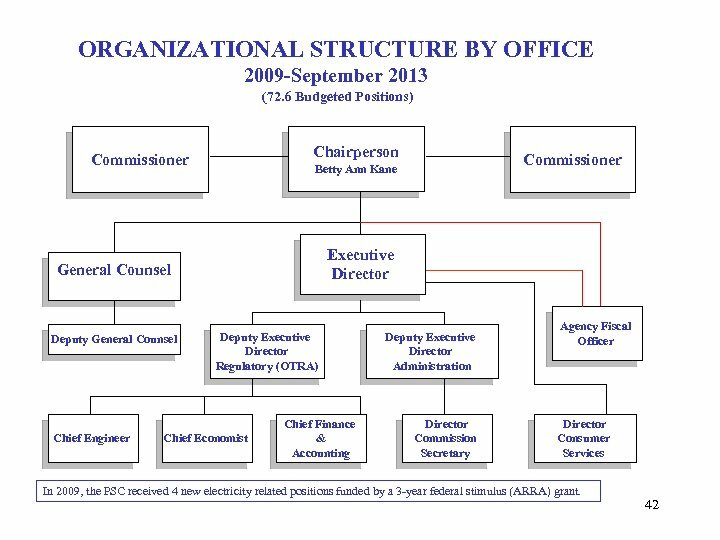 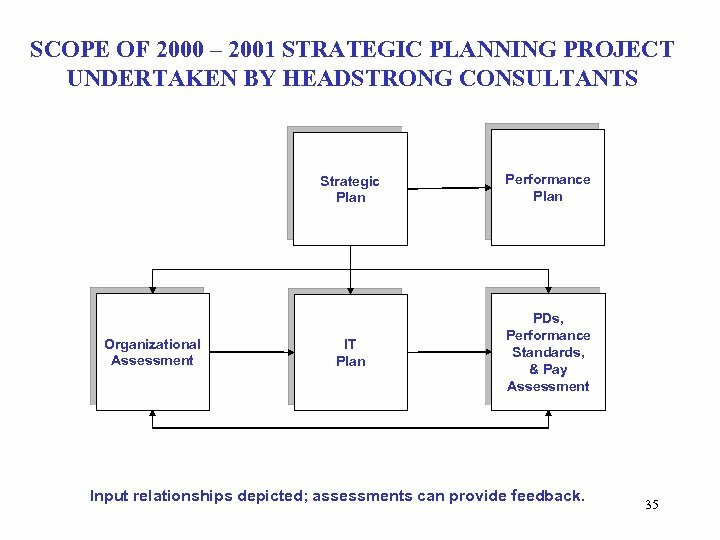 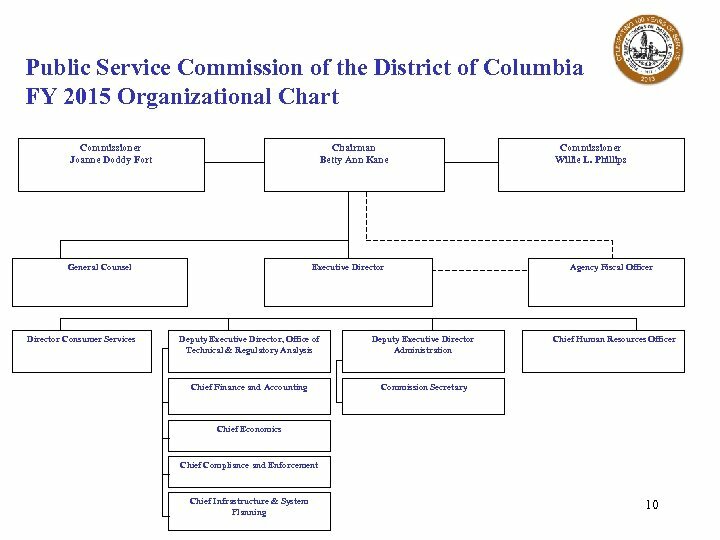 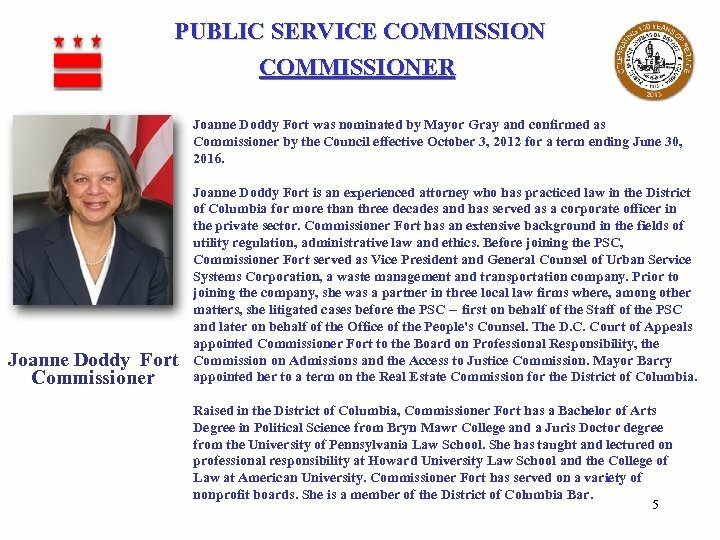 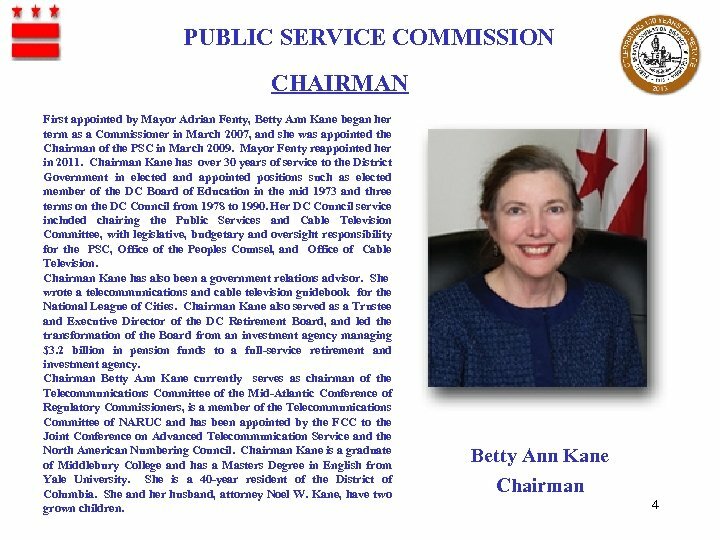 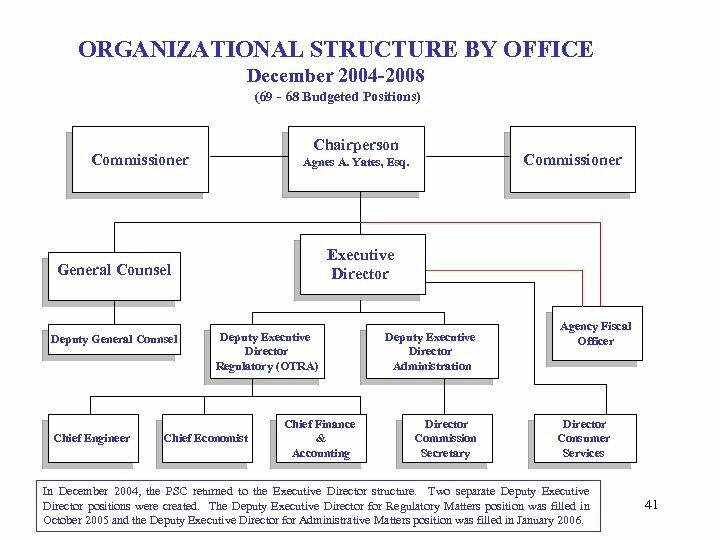 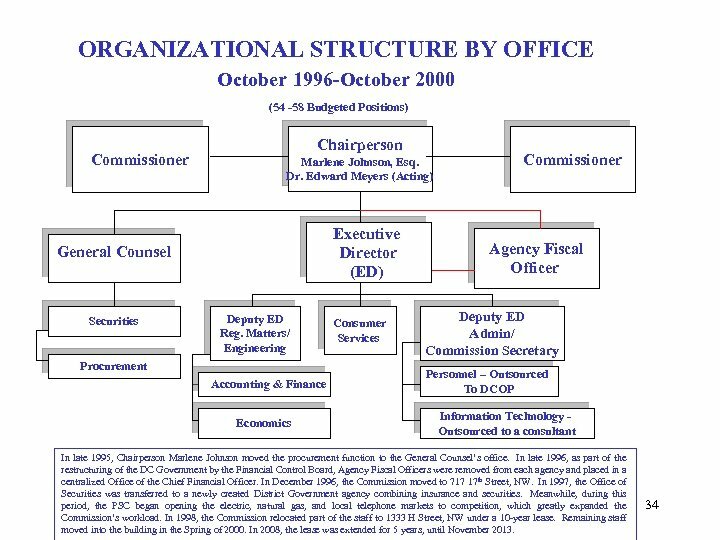 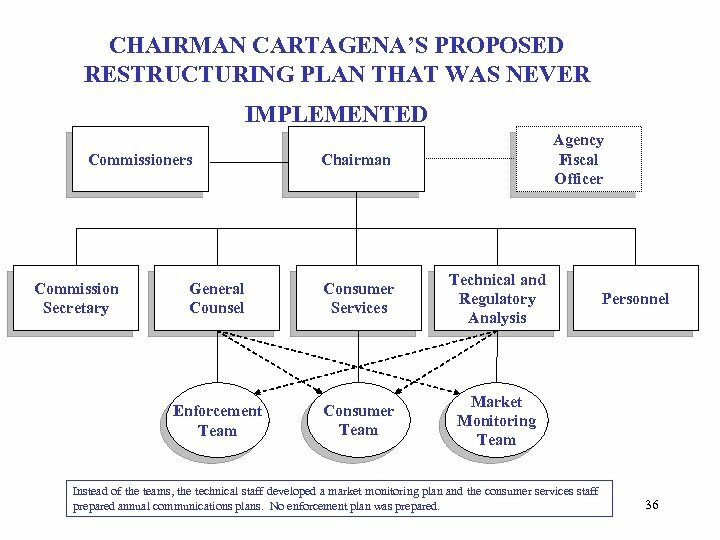 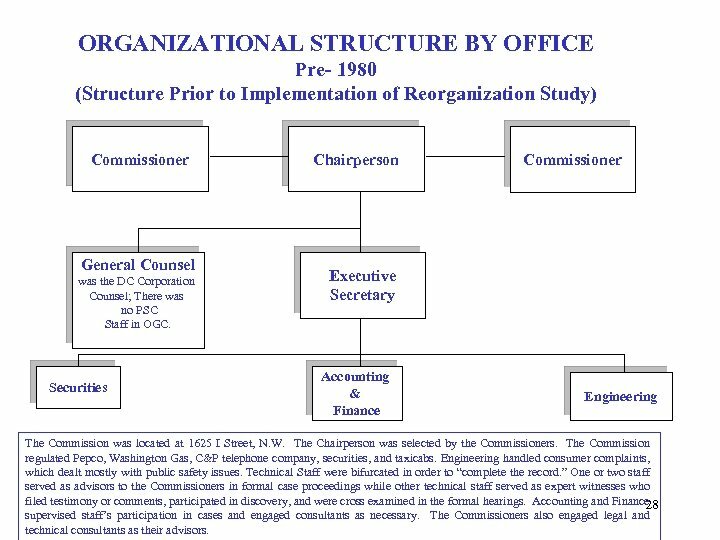 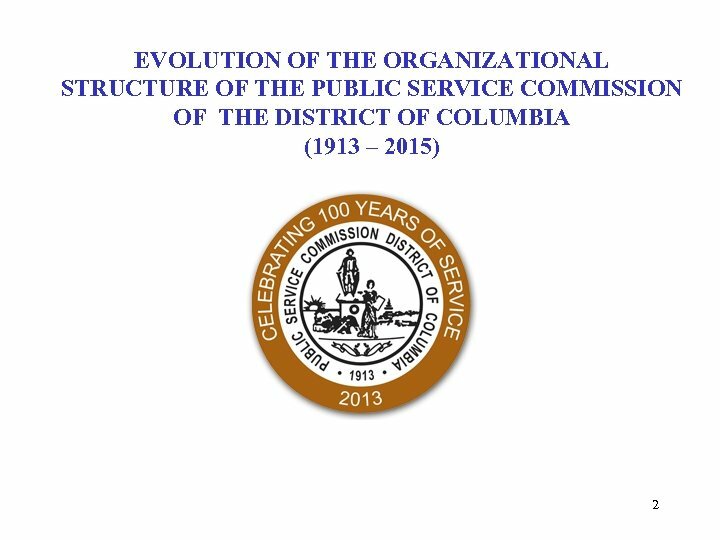 ORGANIZATIONAL STRUCTURE BY OFFICE Pre- 1980 (Structure Prior to Implementation of Reorganization Study) Commissioner General Counsel was the DC Corporation Counsel; There was no PSC Staff in OGC. 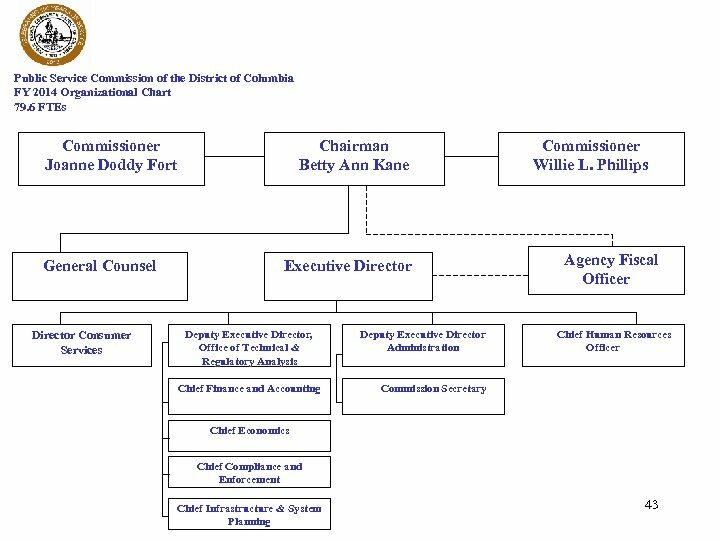 Securities Chairperson Commissioner Executive Secretary Accounting & Finance Engineering The Commission was located at 1625 I Street, N. W. The Chairperson was selected by the Commissioners. 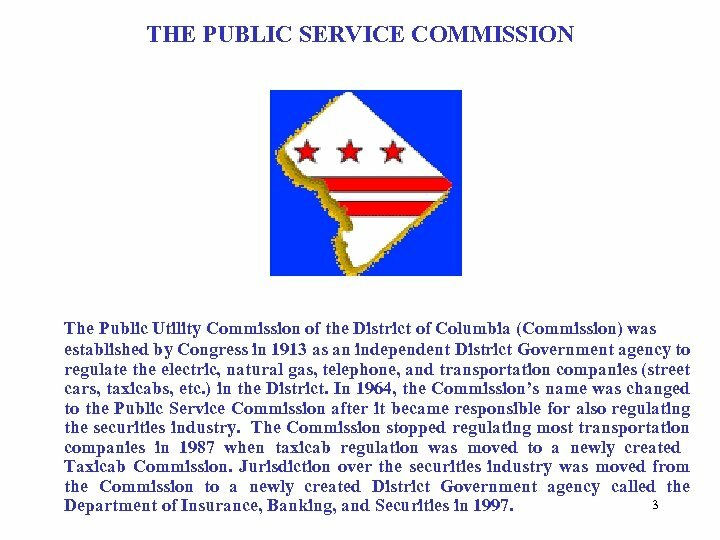 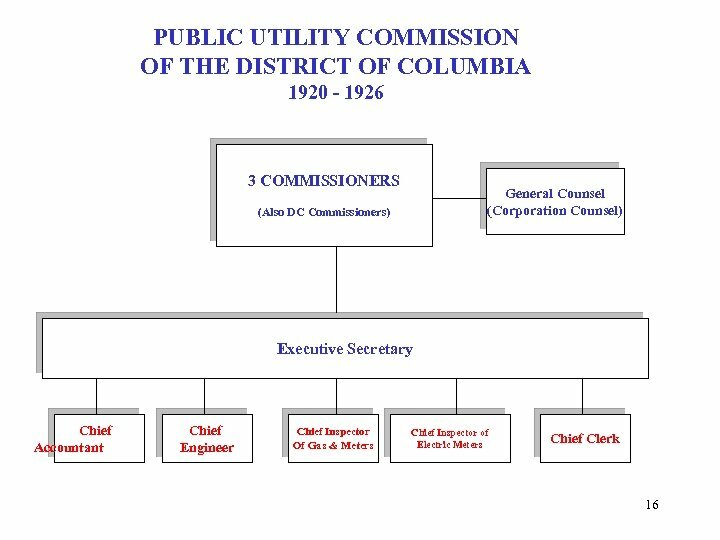 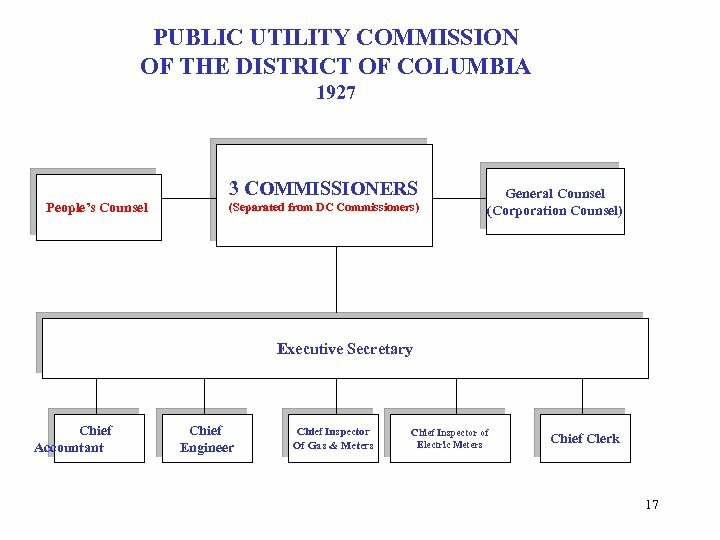 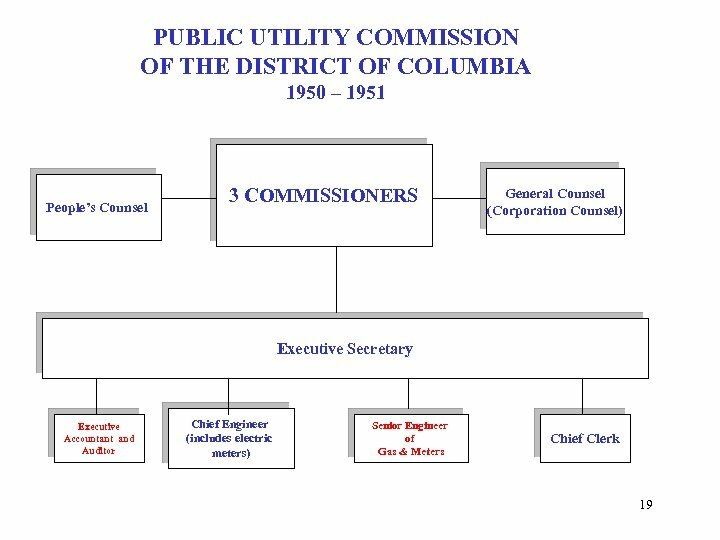 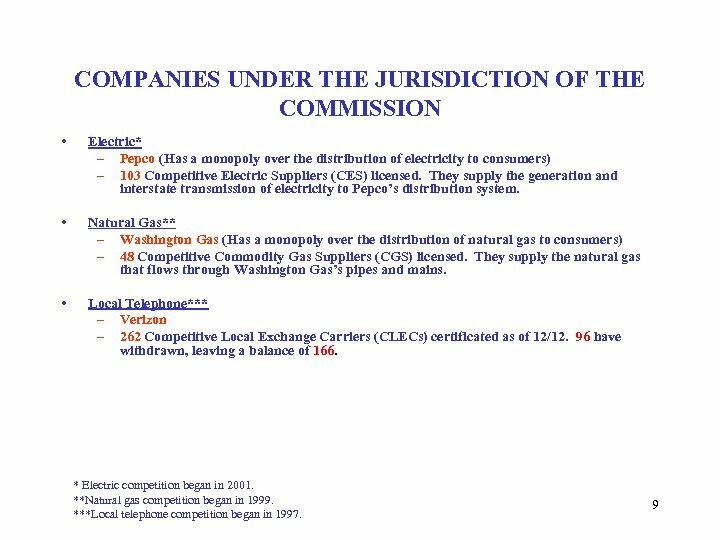 The Commission regulated Pepco, Washington Gas, C&P telephone company, securities, and taxicabs. 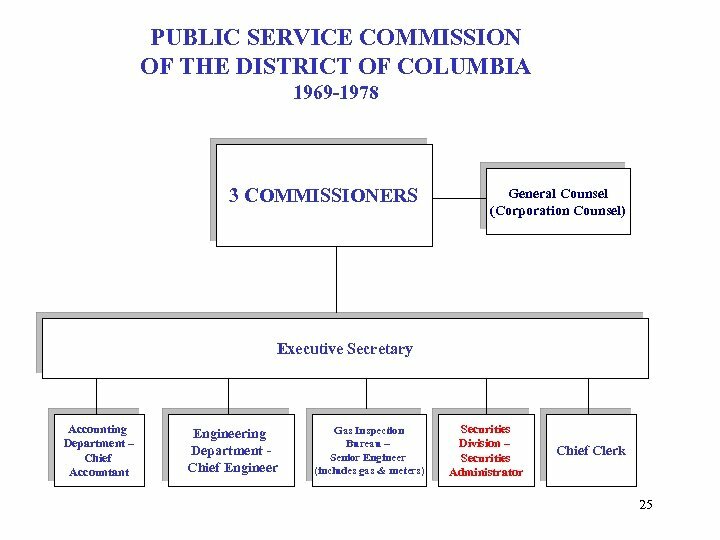 Engineering handled consumer complaints, which dealt mostly with public safety issues. 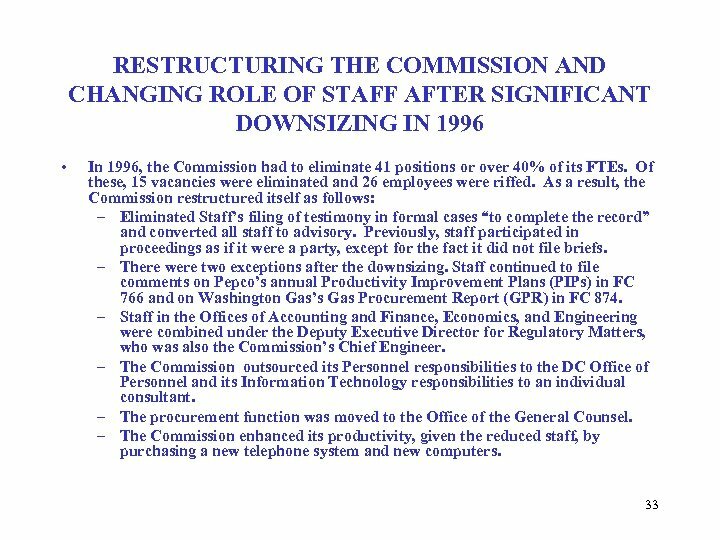 Technical Staff were bifurcated in order to “complete the record. 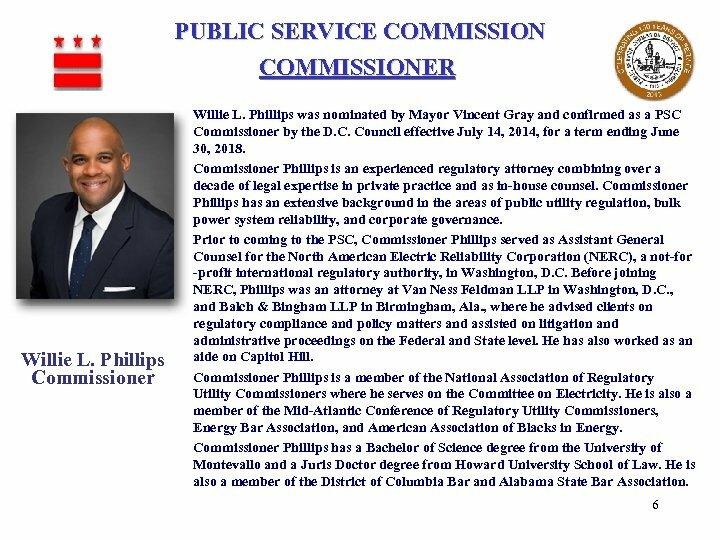 ” One or two staff served as advisors to the Commissioners in formal case proceedings while other technical staff served as expert witnesses who filed testimony or comments, participated in discovery, and were cross examined in the formal hearings. 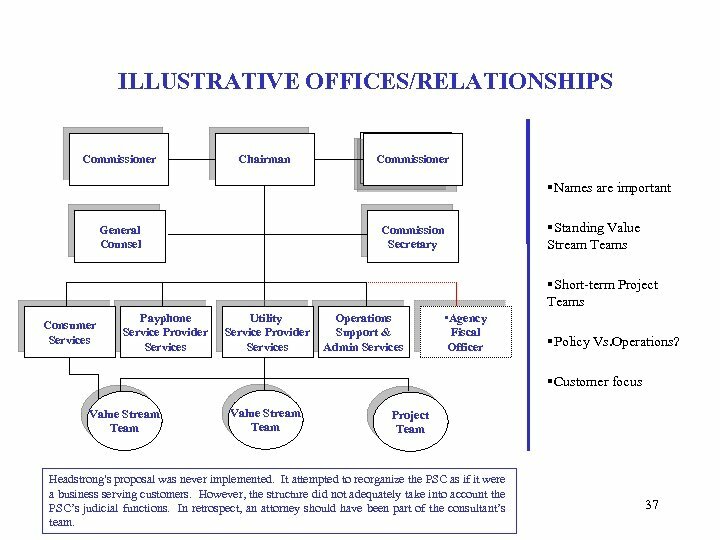 Accounting and Finance 28 supervised staff’s participation in cases and engaged consultants as necessary. 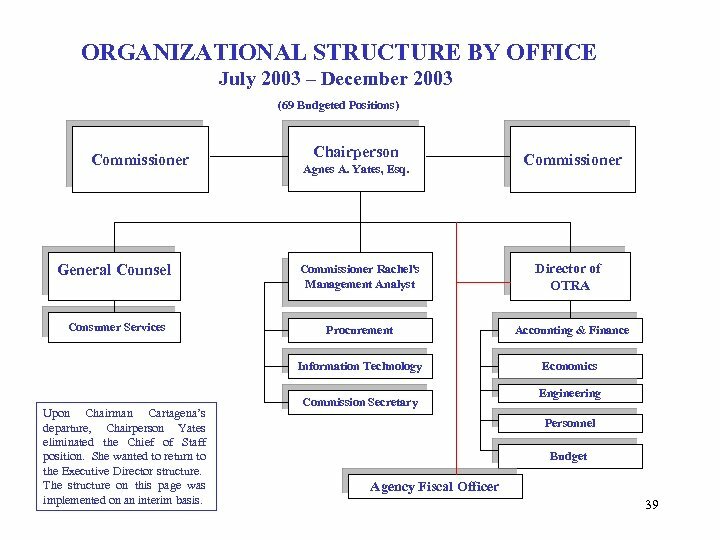 The Commissioners also engaged legal and technical consultants as their advisors. 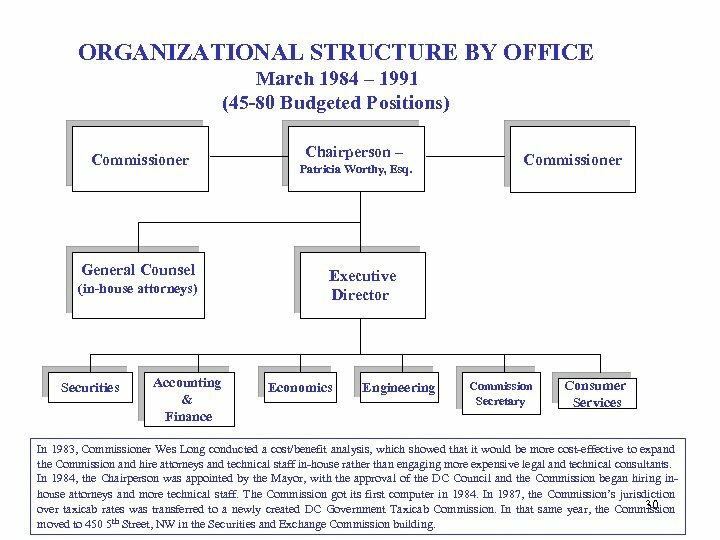 ORGANIZATIONAL STRUCTURE BY OFFICE 1980 - - March 1984 (27 -45 Budgeted Positions) Commissioner Chairperson Ruth Hankins-Nesbitt, Esq. 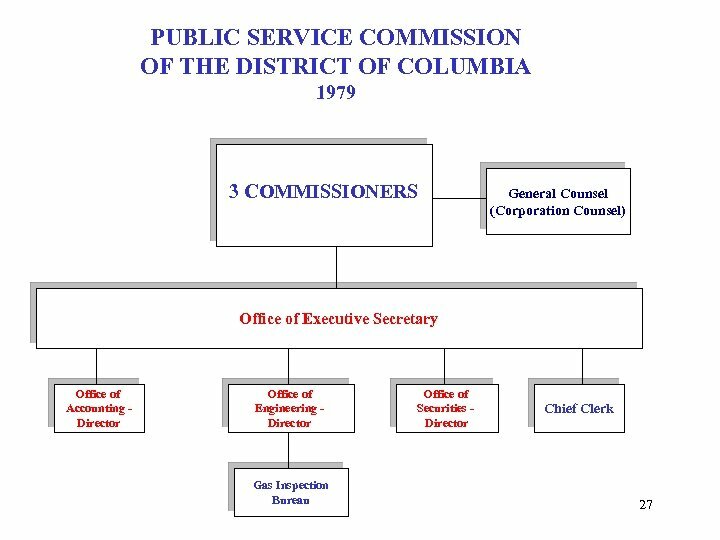 Executive Director General Counsel (No in-house-staff) Securities Accounting & Finance Commissioner Economics Engineering Commission Secretary Consumer Services The Commission moved to the Old City Hall at 451 Indiana Avenue, NW in 1980. 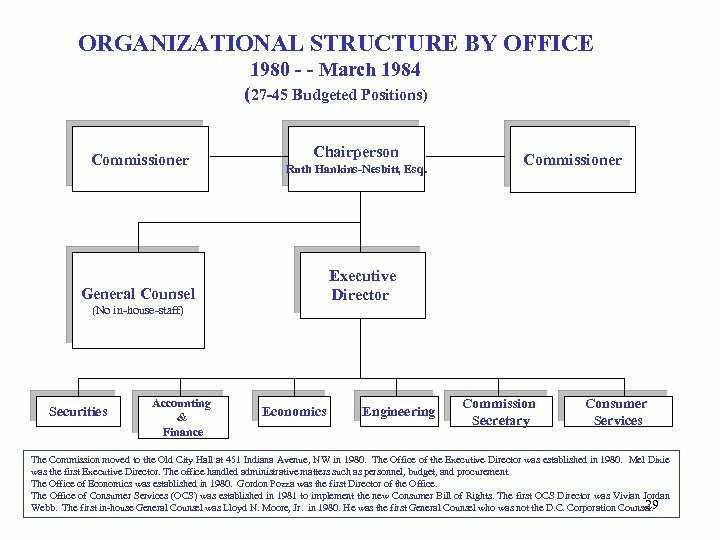 The Office of the Executive Director was established in 1980. 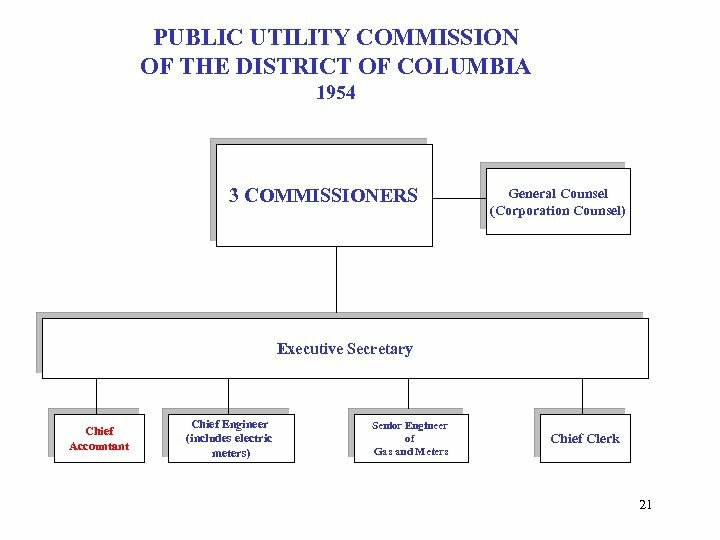 Mel Dixie was the first Executive Director. 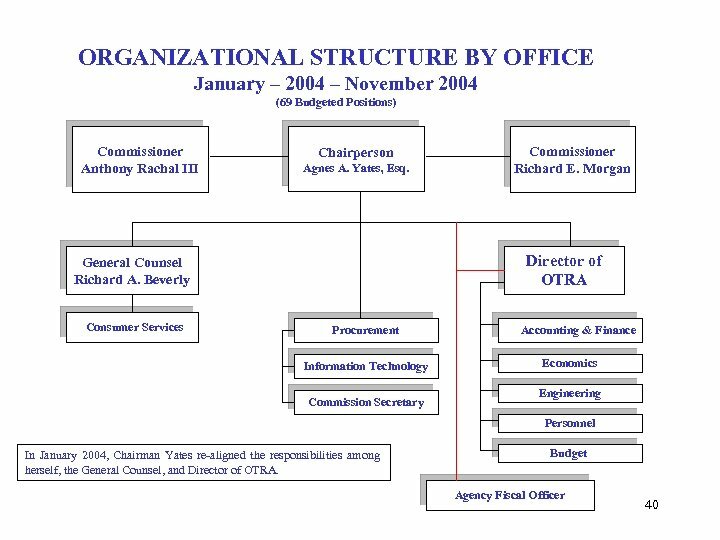 The office handled administrative matters such as personnel, budget, and procurement. 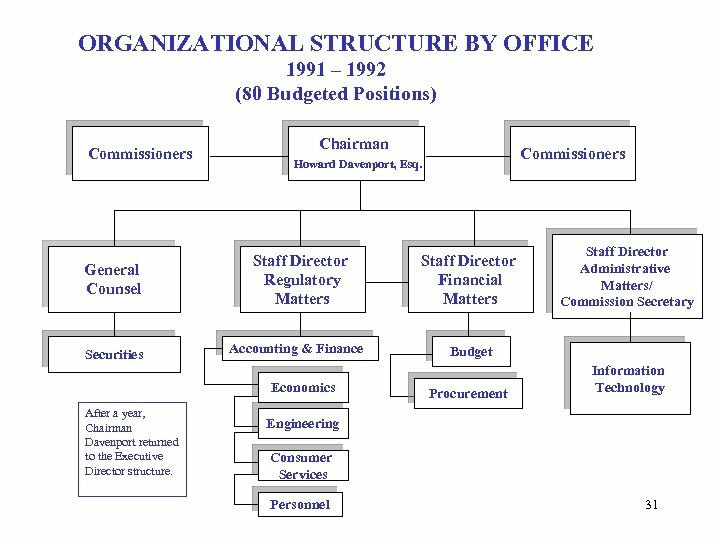 The Office of Economics was established in 1980. 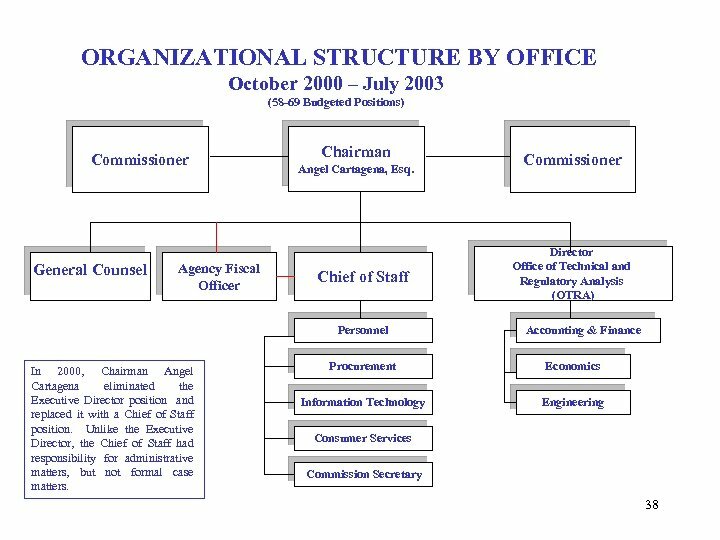 Gordon Pozza was the first Director of the Office. 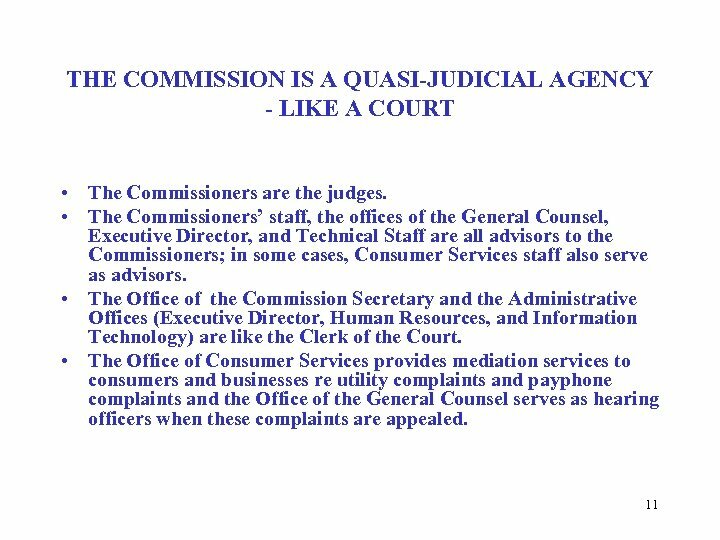 The Office of Consumer Services (OCS) was established in 1981 to implement the new Consumer Bill of Rights. 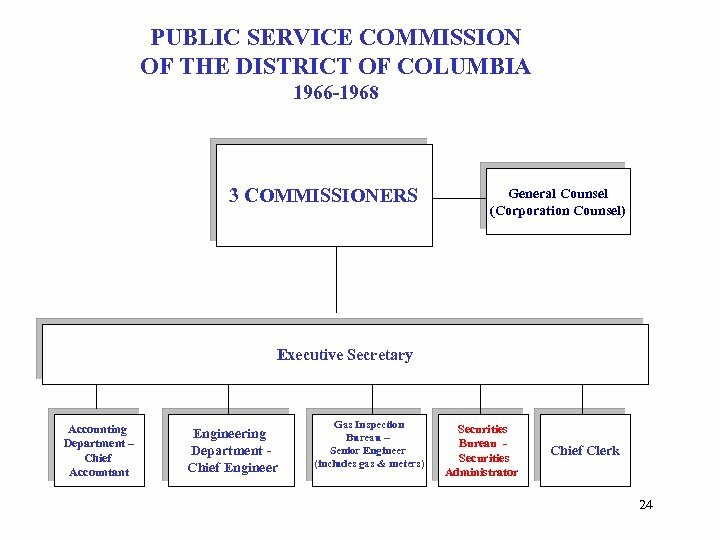 The first OCS Director was Vivian Jordan 29 Webb. 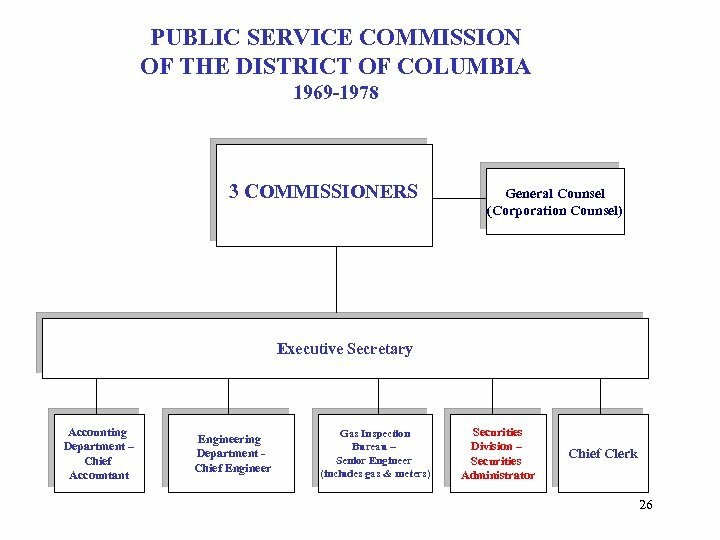 The first in-house General Counsel was Lloyd N. Moore, Jr. in 1980. 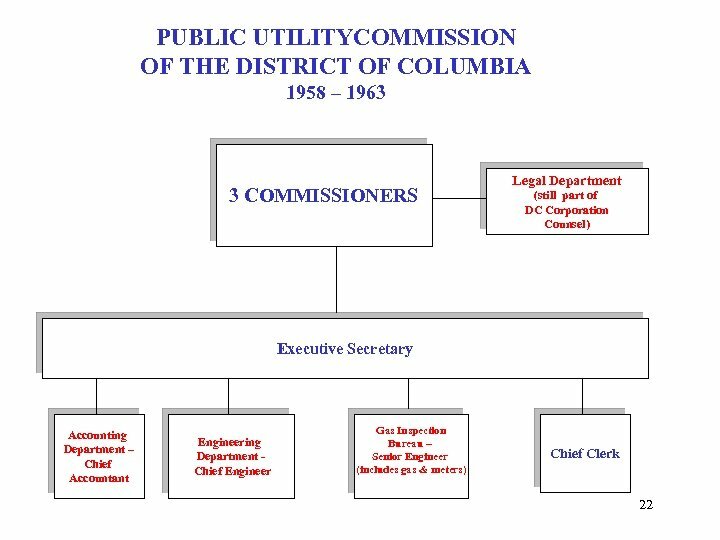 He was the first General Counsel who was not the D. C. Corporation Counsel.